Hey NYC area friends! Looking for something fun to do with the kids, as they head back to school? How about heading to see one of New York's most successful teams, The Liberty, play at Madison Square Garden? The team is currently making a run to qualify for the WNBA playoffs, and on Friday September 9th, Laura Marano is going to be playing a special halftime show! Parents, if you have a Disney channel fan (or two) in your house, you most likely know Laura Marano from her starring role as "Ally" in Disney Channel's international hit television series, Austin & Ally. This special halftime performance promises to be a memorable one, and will feature Laura's hit "Boom Box" and her new single "La La". The first 5,000 fans will also receive a Kids Foot Locker pocket folder and a Laura Marano photo card! Read on to grab the details on the game and for a link and coupon code to purchase a special VIP ticket package, that includes a special meet & greet with Laura Marano after the game! We can't wait for the game and for this special halftime show! See you there! It's Back to School Night presented by Kids Foot Locker at Madison Square Garden Friday, September 9th. Come out and watch NY Liberty live as they continue in their pursuit for a 2016 WNBA Championship. 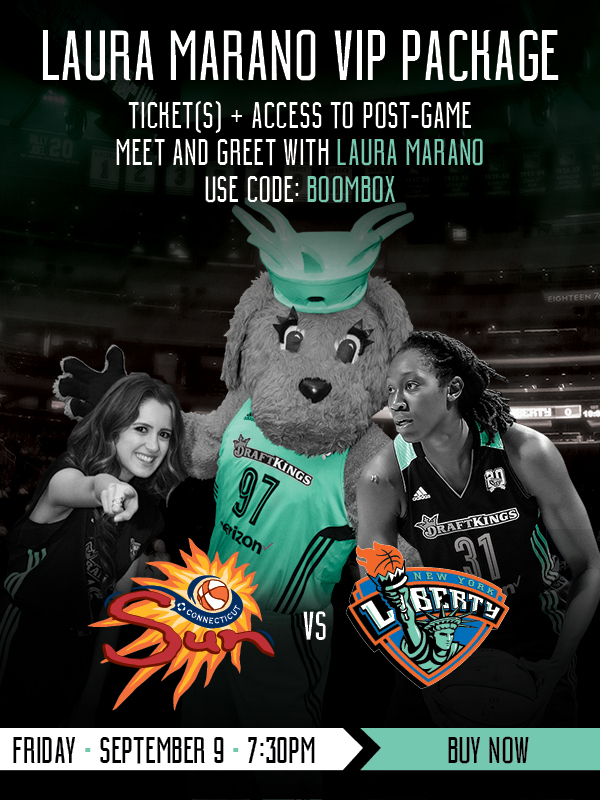 With the VIP Package, you get the change to see great basketball, Laura Marano perform live at halftime and exclusive access to a post-game meet and greet with Laura Marano (use code: BOOMBOX at checkout). You don't want to pass up on this package, so SHOW UP, because thats what New Yorkers do! Disclosure: media access / tickets were provided so that we may attend the event and report back on our experience. All opinions expressed are our own.